Sound "The results ranged from better than I thought possible to miraculous. Each record looked utterly clean, and most of them played very well. " "Some people...claim differing sonic properties for various cleaning fluids and even different record-cleaning machines." "It only makes sense that varying sonics would signal that something has been left on the record, and that's incompatible with the idea of cleaning records in the first place." Features The Prelude Deluxe kit "comprises three products for cleaning records along with all of the accouterments -- brushes, measuring scoops, extra bottles, extra pads for the brushes, and instructions -- you'll need to do the job, except a record-cleaning machine." "You use the Walker Prelude Deluxe kit in a systematic way, applying the three fluids in sequence with the supplied brushes, each of which is numbered so you don't mix them up." Use "Cleaning each LP requires 16 separate steps -- four applications of fluid and four vacuum cycles per side -- which, for me, meant about ten minutes of work per LP. I suppose I could have cut corners, taking less time to work in the fluids with the brushes, but that rather defeats the purpose." Value "In the end, the work and cost involved with using the Walker Audio Prelude Deluxe kit are the only demerits for what is a very effective combination of products for cleaning even the filthiest LPs." You only have to look at his product line to know that Lloyd Walker is an incurable tinkerer. No one sets out to create a $40,000 air-bearing turntable with matching tangential-tracking tonearm followed by some of the beefiest cone footers extant along with lead-lined pucks for them, a power conditioner, and a CD treatment, then follows it all up with a contact enhancer and a device for demagnetizing LPs and CDs. But that's what Lloyd Walker has done. I suspect that each of these products came about as the solution to an issue Lloyd encountered, the scratch for an audio-related itch. I doubt Lloyd devised a business plan based on first producing his Proscenium turntable and eventually leading to his Extreme SST Super Silver treatment. Those are dots that not even a wiz kid with a Harvard MBA can connect. And yet Walker Audio thrives, introducing unusual products and sometimes perplexing those of us who write about audio equipment (which isn't always that difficult). I for one won't be surprised when Lloyd's first speaker hits the market, followed by some new fluid or cream for cleaning a cartridge's stylus. When you're incurable, the disease never goes away. So it was with no amazement that I came across Lloyd's system for cleaning records, the Prelude Deluxe. "Endorsed by Keith Jarrett" and sold with a 30-day money-back guarantee, it comprises three products for cleaning records along with all of the accouterments -- brushes, measuring scoops, extra bottles, extra pads for the brushes, and instructions -- you'll need to do the job, except a record-cleaning machine. While other cleaning products are deemed perfectly fine for cleaning by hand, the Prelude Deluxe system requires a VPI, Loricraft, Hannl or some other brand of cleaning machine. I'm sure this requirement limits the market for the Prelude Deluxe, but it also ensures the best results. Besides, the Prelude Deluxe's $135 USD price aims it directly at earnest vinylphiles, people who consider a record-cleaning machine mandatory (as anyone even semi-serious about vinyl should, but that discussion is for another article). You use the Walker Prelude Deluxe kit in a systematic way, applying three fluids in sequence with the supplied brushes, each of which is numbered so you don't mix them up. The first fluid is one you mix yourself; into a measured amount of the supplied Ultra-Pure Laboratory-Grade Water you mix a scoop of white powder that looks like laundry detergent but is odorless. This solution boasts enzymes that remain active for around eight hours, so you'll want to mix the solution right before you're going to begin cleaning records. Enzymes are catalysts that are used in many cleaning products because they break down water-insoluble stains and replace large amounts of detergents. The use of enzymes in a record-cleaning solution makes complete sense. Smudges on LPs are usually from handling and come from the oils on our hands. Enzymes are very effective on these. Also, because you want to remove whatever cleaning products you put on your LPs, any highly diluted formula is preferable to one that's full of chemical detergents. Analog - Music Hall MMF-5.1SE turntable package, Aurum Acoustics Integris CDP phono stage. Speaker cables  Shunyata Research Orion Helix, Crystal Cable Ultra. Step two is applying the Prelude Pre-Mixed Cleaning Solution, which a quick sniff will tell you has some alcohol in it. The use of alcohol-based products to clean records is somewhat controversial. No one denies that alcohol is effective, but some claim that it hurts the vinyl, making it more brittle and thus susceptible to damage from the force of the stylus dragging through the groove. My thinking is that a short application with a thorough removal and rinse gives you all of the cleaning benefits and mitigates any potential for harm. Lloyd Walker agrees with me, because step three of the Prelude Deluxe system is a rinse with the included Ultra-Pure Water. Actually, this is steps three and four, as Lloyd recommends two rinses. How to use the Prelude Deluxe system along with your record-cleaning machine will require a little thought before you begin cleaning records. If you have a VPI HW-17 or HW-27, both of which have a built-in fluid applicator, you'll need to decide which two fluids to apply by hand and which one to apply with the pump applicator. To me, there was only one choice: enzyme and cleaning fluids by hand, Ultra-Pure Water with the applicator. In fact, I use the VPI's applicator with rinse water only, choosing to work in any cleaning fluids manually. Water is water, while cleaning fluids vary, and I don't want to use one with the applicator, then another, flushing the tubing and changing the brush along the way. With the Prelude Deluxe kit, because of those finishing rinses, using the record-cleaning machine to apply the water makes especially good sense. The process is simple, if time-consuming because of all the application and vacuuming you have to do. Dribble on an amount of the active-enzyme treatment, working it in with the appropriate brush. This fluid spreads nicely, and the brush has enough loft so that it doesn't act like a squeegee and just push the fluid around the record. I worked the fluid in for about a minute, then vacuumed it off. I did the same for the Pre-Mixed Cleaning Solution, making sure to use the corresponding brush, and then finished with a pair of rinses. I did not skimp with the rinse water, creating a sluice that I worked in with the brush forward and backward (the HW-17 and HW-27 can both rotate the record bidirectionally). Given this, I may be out of the water before either of the other fluids, even though Lloyd supplies a half-gallon of it with the Prelude Deluxe. Some of you are probably wondering why I didn't mention changing out the VPI vacuum wand for each fluid. I didn't mention it because I didn't do it. I asked Lloyd about this before receiving the Prelude Deluxe, and his reasoning made complete sense: "The two finishing rinses of the record will also rinse the vacuum pads and flush the wand." The word "contamination" has been thrown around in regard to using the same vacuum wand for multiple fluids. Contamination? We're cleaning records here, not extracting DNA! In practice, the two rinses kept the vacuum wand clean. After a couple of dozen records, I compared the used wand to a new one, and the two looked identical. Even with all of the fluid to be vacuumed up, the pads on the wand were never more than very barely damp at the inside edges, where the fluid is sucked in. In the end, I didn't worry about contaminating anything by not changing wands and left my hazmat suit in the closet. To test the Prelude Deluxe to its utmost, I cleaned as wide an array of LPs as I could -- everything from brand-new records to the grimiest garage-sale finds. The results ranged from better than I thought possible to miraculous. Each record looked utterly clean, and most of them played very well. A few, including a thrift-store copy of Dave Brubeck's Countdown - Time in Outer Space [Columbia CS8575], were still noisier than I had hoped, but that's the breaks, Bubby. You never know what's happening down in the grooves, and the Prelude Deluxe can't repair physical damage. Still, I was consistently pleased with the results. Even with LPs that looked like they had been handled by a clumsy fry cook and then dusted with cocoa powder, the Prelude Deluxe -- along with the VPI HW-17 or HW-27, that is -- removed every noticeable stain or bit of grime, and after playing them, there was no residue on the stylus. Clean doesn't get any squeakier than that. Some people (maybe the same ones who are contaminating their record-cleaning machines) claim differing sonic properties for various cleaning fluids and even different record-cleaning machines. I have fluids from a few different makers, and I used two different cleaning machines (albeit from the same company). I couldn't attribute greater midrange transparency or better bass definition to any of them. Clean is clean, and with the Prelude Deluxe and either VPI machine, clean -- less groove noise, fewer ticks and pops -- is what I got. And that's all I expected. It only makes sense that varying sonics would signal that something has been left on the record, and that's incompatible with the idea of cleaning records in the first place. VPI sends a bottle of its own cleaning fluid along with each HW-16.5, HW-17 and HW-27, but it doesn't match the results of the Prelude Deluxe system visually or in terms of getting deep into the grooves, even after I spiked it with some ultra-pure isopropyl alcohol and followed with a water rinse. I ended up giving the LPs initially cleaned with the VPI fluid a going over with Prelude Deluxe, and in every case the results were obvious: a cleaner-looking surface and less noise of all kinds. But there are a couple of issues with the Prelude Deluxe that don't apply to the VPI fluid. First and foremost, cleaning each LP requires 16 separate steps -- four applications of fluid and four vacuum cycles per side -- which, for me, meant about ten minutes of work per LP. I suppose I could have cut corners, taking less time to work in the fluids with the brushes, but that rather defeats the purpose. I also have to consider the wear and tear on my record-cleaning machine, including the fact that with a VPI, I'll have to replace the applicator brush and vacuum wand after cleaning fewer LPs. Second, there is the cost. 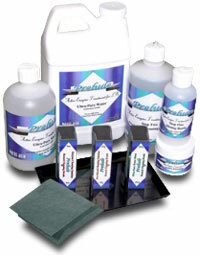 Lloyd Walker estimates that each Prelude Deluxe kit is good for 120-175 cleanings. At $135 for the kit, that could work out to about $1 per LP cleaned, which isn't very economical, especially when a couple of the thrift stores in my area sell used LPs for ten cents each. Lloyd did point out that once you've Preluded an LP fully, you can omit a couple of steps for subsequent cleanings, using the Pre-Mixed Cleaner and one rinse for a moderately dirty LP, and just a rinse for a slightly dusty one. However, if you store your cleaned LPs right, giving each a new, high-quality rice-paper inner sleeve and putting an outer sleeve over the jacket, you will probably never have to do more than sweep with a carbon-fiber brush before playing. In the end, the work and cost involved with using the Walker Audio Prelude Deluxe kit are the only demerits for what is a very effective combination of products for cleaning even the filthiest LPs. If you have a record-cleaning machine and a pile of dirty LPs, Lloyd Walker can supply everything else. Tinker on, Lloyd!